If you don’t subscribe to Project Loon’s Google+ account, then I would highly recommend that you do. Sure, it’s all a marketing effort to promote Google’s crazy plan to connect the world through a balloon-based broadband network, but the blog is often gripping, seat-of-your-pants reading as Google describes the adventures of its dirigibles as they traverse the heavens. On Thursday, Google recounted the journey of one balloon, No. 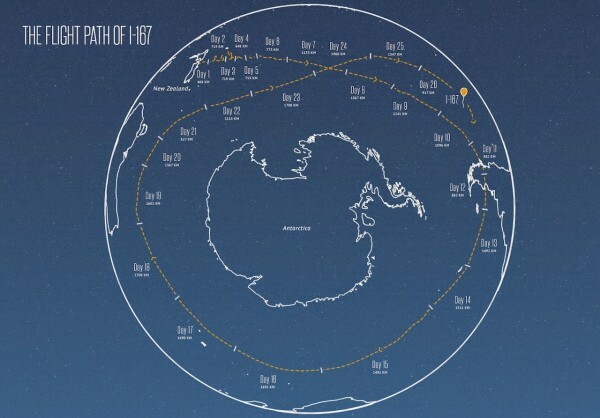 I-167, as it completed a trip around the globe in the southern hemisphere in just 22 days, compared to the 33-day voyage the typical balloon takes to circumnavigate the earth. Who knows if Project Loon will ever pan out. As I’ve written before, building Loon isn’t just an ambitious technological feat, but also a massive political undertaking as Google tries to build the world’s first stateless wireless network inside the Earth’s atmosphere. But watching Google try to make the project work is worth the price of admission.